According to the 1725 edition of An Account of Several Workhouses..., parish workhouses already existed at Abbott's Langley, Aldenham, and Watford. A parliamentary report of 1777 recorded parish workhouses in operation at Watford (for up to 100 inmates), Abbotts [Langley] (44), Aldenham (30), and Rickmersworth [Rickmansworth ] (80). Aldenham's workhouse was built in around 1782 to the north of the parish church. The long building was divided into a men's half and a women's half. After the formation of the Watford Poor Lawe Union in 1835, it was sold off to the Stuart family of Aldenham Abbey (later Wall hall) and was converted into an inn known as the Red Lion. The venture proved unsuccessful and the building was converted into dwellings known as Red Lion Cottages which still stand today. County of Hertford: Abbot's Langley (2), Aldenham (2), Bushey (2), Rickmansworth (4), Sarratt, Watford (5). The population falling within the union at the 1831 census had been 15,379 with parishes ranging in size from Sarratt (population 452) to Watford itself (5,293). The average annual poor-rate expenditure for the period 1832-35 had been £8,473 or 11s.0d. per head of the population. 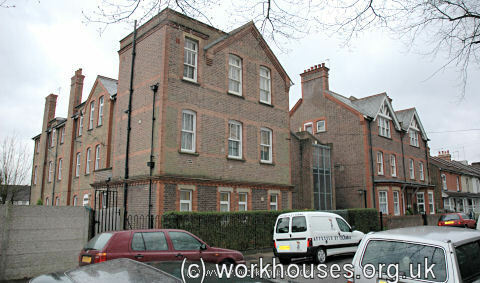 A new Watford Union workhouse was built in 1836-7 on the south side of Hagden Lane (now Vicarage Road) in Watford. It was designed by TL Evans who was also the architect of the Bishop's Stortford and Westbury & Whorwellsdown workhouses. The location and layout of his Watford design are shown on the 1913 OS map below. Watford entrance block from the north-east, 2004. Watford entrance block from the north, 2004. Watford general view from the south-east, 2000. Watford workshop block from the east, 2000. Watford infirmary block from the south, 2000. From 1904, to protect them from disadvantage in later life, the birth certificates for those born in the workhouse gave its address just as 60 Vicarage Road, Watford. After 1929, the workhouse changed its name to Shrodells Public Assistance Institution. After the introduction of the National Health Service in 1948 it became Watford General Hospital. In the early 1900s, Watford set up at least two scattered homes. One of these was large house at Ashby Road, Callow Land, Watford, which in 1908 could house 15 boys and 15 girls. By 1929, an extension to the building had increased its capacity to 65. The property is now in private residential use. 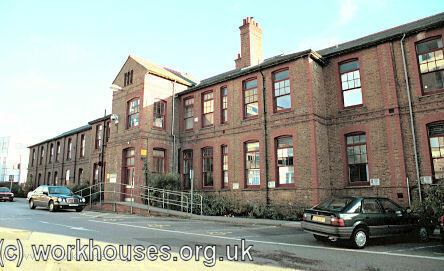 Former children's home, Ashby Road, Watford, 2005. By 1915, another home was in operation in a property known as Stamford House on Park Road, Watford. The building no longer exists. Hertfordshire Archives and Local Studies, County Hall, Pegs Lane, Hertford SG13 8DE. Limited holdings include: Guardians' minutes (1835-1913); Register of children (1903-38). Watford Museum, 194 High Street, Watford, Hertfordshire WD17 2DT. Holdings: Register of births in the workhouse (1866-1933); Register of deaths (1948-58); Punishment book (1914-43).